stickboybike: Bianchi Pista Speciale Concept? The Pista in progress. This was before the Cranksgiving ride last week. 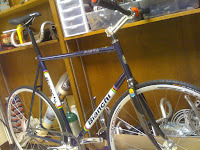 I did install a front brake, cx lever and a 39t chainring. That's a fork off an old Boron XL. I probably won't keep it on as riding wheels can't be good for the lifespan of the fork. A tall bike for a tall guy--6' 5" in fact. I like the geometry of the bike but would really like the Pista Concept geometry with a steel 521 tubeset, lugged with chopped risers...hmm. Let's work on that, please!